It takes very little time for the actual cooking, but for the best result for the crispy juicy skin, I like to season the duck breast 2 days in advance. I simply season both sides of the meat with salt and pepper, and rest it skin-side up in a plate with the cover for the first 2 nights, then uncover in the morning of the cooking and let the skin air-dry in the fridge until 1 hour prior to cooking. If you don't have time, you can season the meat just a couple of hours before the cooking and it will still be good. Season both sides of the duck breasts and let it rest in the fridge for 2 hours to 2 days. Take them out of the fridge 1 hour before cooking. Score the breast skin with a knife (about 1/2" wide). 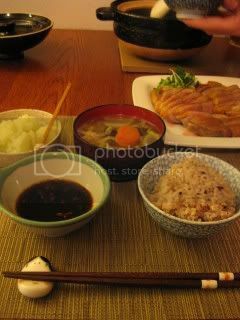 Meanwhile, combine the ingredients for the ponzu and set aside. 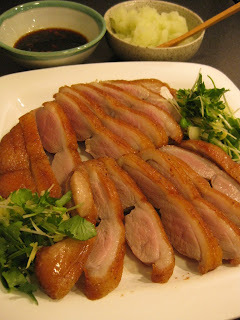 To cook the duck, heat the pan to medium-low. 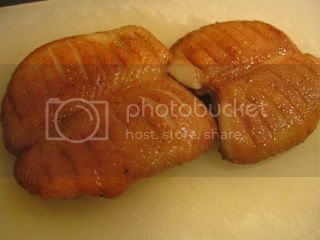 Place the breasts skin-side down on the pan and cook until the skin is golden-brown (about 10 min). By then, the duck should release a lot of fat grease. Discard the fat grease or save it for another use. Turn the meat over and continue to cook for 3-4 minutes. Transfer the meat to a cutting board, cover with the foil and let the meat rest for 5 minutes. Slice the meat and enjoy with the ponzu sauce, grated daikon, and mixed herbs. Duck dinner was served with donabe rice, made by Jason.